I am spending a few weeks away from the hussle and bustle of Kuala Lumpur at the Lake Kenyir Resort and Spa in Terengganu, Malaysia. in 3 words: paradise, paradise, paradise! Lake Kenyir is a lake as big as Singapore, caused by the Kenyir Dam: that's why you can see those strange treetops sticking above the water of the lake. 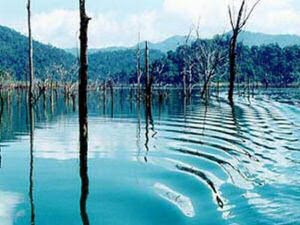 Paradise for nature lovers that is: lots of birds, fishing or jungle trekking.